Here you will be able to find lots of fan made levels made by the community during the many years since the game was released. Please be aware that this page contain both working, broken and test levels. If you have any issues, feel free to join our forum and ask for help or in the comments on the bottom of the page. Anna's level she made for her 1 year anniversary at TresCom. Trespasser's 20th Anniversary level made as a collaboration between the TresCom users. Worked on for almost a year the current version is here, fully playable from start to end. You can use this level with the CE patch to use the custom sky made for it. See the CE patch documentation on how to install custom levels or place all files in your /data folder along with the rest of the levels. OK, here is the renamed and resaved version of The Four Towers Extended, now you don't need to replace the original lab level files since the level is now called "4twrsext" instead. You can also restart the level without problems now. For anyone who wants to play through my version of Ascent, there are two new alternate routes, some added foliage and dinosaurs, and a lot more space to explore. I reuploaded it, I'm sure it's right this time. A very simple test level Asjad made to test an animation script with a Raptor. A combination of Ascent I, II and Summit into one huge level. Fully playable and can replace the original ones if wanted. This was the first version of The Beach Reloaded. This is no longer the way the level should be. could became a really nice one! chronzerg's Beach Arena level, although the .pid file is missing in the release. chronzerg, do you still have it anywhere? Welp, here's a picture on what the base of the layout for the new level will look like. I think I'll call it, "Beauty and horror". One side of the land shall be full of natural, and gorgeous vegetation and herbivores, while the other side will be full of dark, and sinister colored terrain, with little vegetation, along with some good dangerous dinosaurs. "This week's level is an expression of my experience with the bridge. It's not the first time I have used Tres modding to handle strong emotional tides. It's a very short level; let it stand as testament to my enduring presence in this world and at TresCom." "Canopy Valley is a brief modding project of mind done mainly as stress-relief - a not-too-complex-mod with an assortment of terrain textures, models, and dinosaurs. The player gets to roam around a canopied forest landscape and hunt dinosaurs (sorry, no helicopters). Enjoy!" "I'm working on expanding my entry level for the week of trespasser contest. there will be more to do, more to see. It will have a second compound that the bridge will connect to. It will have more dinos, Easter eggs and other thing." A helicopter that had been tracked in the past week, rendezvoused at a location deep within the Siberian tundra. It was detected to have crashed less than a mile away from an abandoned communications base, though lately there has been activity with trucks taking into boxes. A vial of a mysterious virus called DX was stolen from a facility a week ago, it is believed this vial was on-board the helicopter to move it West out of Siberia. Your mission is to locate the downed the helicopter and retrieve the vial. The coolest level ever! Seriously, I don't even have to lie on this one! RexHunter99 created this Christmas level for all of you who just happen to know that they deserve something extra special this christmas. So yeah, it may have been a while since we updated, but you ain't gonna get around this treat. As part of the releases for W-o-T 2007, here we have one of Slugger's test levels, "Coke_n_more". This level features, among a couple other things, a working Coca-Cola vending machine. Download this fun little level. Well, well! Craters is finally finished. I probably spent more time on it than I should have, but it's finished and I like the results. *Note: Included in the download are two new Huds, BoneHUD and SwampHUD (both are optimized for 800x600). Hey guys, I've made a edit of this level. All I've done is added more dinosaurs such as from the JPDS and others, more ammo add, easy to get around and other tons of stuff edited. A big thank you to "Awesome" for helping me some tips on TresED. Credits goes to those owners that made the models of the dinosaurs and other stuff. The standalone ATX version of Rebel's Crossbow contest level. The CE version of Rebel's Crossbow contest level. Draconisaurus' original entry for the 2010 Arena Contest. If you can't get it to work, try the other version instead. Drac's Cursed Arena level updated. Everyone please use this version. It has all needed level files to make it work. Thanks! A small level I made just for fun, using as basis a level Second Illiteration had started and some models I found online. Have fun! A little level I made, its not good^^ but can you find all the Tatu eastereggs? Dear Anne: Dear Anne started out as an idea I had while looking at the Half-Life 2 mod, Dear Esther. It was to take place on a tropical island on which you were completely alone, except for the occasional wildlife. The long-developed storyline may or may not be used in the future, as this project is not completely cancelled. Mountain Lab: Nothing more than a simple little level, Mountain Lab was to feature a series of complex puzzles which would draw you deeper into the titular Lab building, which was set to be a vast, under- and above-ground playing area. Sadly, level corruption occured, and I was forced to re-start. Discouarged by the loss, however, I quit. This altered demo level allows you to play the Trespasser demo at night! Simply replace the two files in the "trespasserdata" directory and load a new game. Don't forget to backup the original files! Loading savegames made in the original level can cause your machine to crash, so be aware. Yet another unfinished level made by Second Illiteration. This one was intended to be an "Easter Egg hunt" type of level, where you had to hunt for... dinosaur eggs, of course! You had to pick up a number of eggs from different species, all the while avoiding the angry parents, and take them to a certain place in order to finish the level. Don't remember the exact storyline, but I think you wwere working for BioSyn or someone else who had paid you to steal the eggs. After S.I. left it unfinshed, the level was used as a starting point for machf's "Dagobah" level. A modified version of the Trespasser Demo by Draconisaurus from February 2005.
ooookay, this took a couple weeks of on-and-off attention but it's finally finished... PL release A: all Max-scene objects + base terrain, all known textures, substitute textures, and of course the sky and player. A philosophy of minimum modification has been applied to this release. Basically the idea is to have a playable version of the Max scene by creating a terrain file with elevations and details based on object locations. Knock yourself out! First draft released in 2009. Old version of DX:Chronicles. This level is the first ever level set on Isla Nublar. It starts out in a location directly from the movie where the player takes the role of Dennis Nedry who must make it to the East Dock with the Barbasol can full of dinosaur embryos. Filled with several new models with a Jurassic Park 1 theme, this level is certainly one that a Jurassic Park fan will enjoy! Note: The download has been split into two parts for those who can't download the single 123MB file in a single session. The first one is ~58 MB, and the second is ~65 MB. Both together contain the same folder/file structure from the original, you just need to extract them together into the same folder and then follow the original instructions. A test level for the Escape from Jurassic Park mod. So what is this? Well back in 2009 and 2010. Draconisaurus and I were talking about Jurassic Park Rampage Edition in the Games board. I started showing him music rips of the 16-bit games I did, the topic went severely off subject and Drac got an idea from there. The idea, was to create a mod based upon a mix of the 16-bit JP games from the 90's. Among them: Jurassic Park for Sega Genesis/Mega Drive, Jurassic Park Rampage Edition for Sega Genesis/Mega Drive, Jurassic Park for Super Nintendo, and Jurassic Park 2: The Chaos Continues for Super Nintendo. I also recently thought of the Sega CD JP game as well. However, the project has been canned by Drac due to lack of time. It's likely it may die if somebody doesn't revive it. I want to be that person, but my modding experience is very poor. As a result, I need some help from anyone willing to. I need modellers, graphical artists, voice actors, and anyone willing to help. I also need someone willing to help me with adding music to TPAs as this is the core of the project in addition to low quality cartoony graphics to fit the 16-bit game feel Drac had planned. For the basic Synopsis Drac had planned and some other text documents related to the project, download the EFJP_Text.rar file. Here's the basic Synopsis Drac had planned for the Escape from Jurassic Park mod, plus some other notes. This is Part one of a series of updated level files. In order to play this level, you will have to replace the original Grf file with the one included in the zip. JPH describes it as 'a huge 20th Century Update', check yourself if he is right! Read the included ReadMe file for further instructions. That's right. Rather than continuing finishing up my playground level, I decided to try doing another map using the Contestlev as a base once again. The name of the level will be Giant Forest. Of course, I don't have the forest quite complete yet. However, I did port over the Mines/Tunnels/Caves from TC Isle and made the import scale 2 rather than 1 so that it would cover greater ground and allow dinosaurs to attack inside of it. A very small level made using the HeightField400x400x8.RAW file as a heightmap to generate the terrain for the level. This is the one that corresponds to the various screenshots depicting the "VIEW" building and some other stuff. This was something I didn't even announce publicly. The admins knew somewhat about it. It's an unfinished remake of the Town designed to look more like the movie. The Ops Center is the most complete aspect, even though there's some texturing issues and I didn't finish making the physics objects yet. I'm certain some of you creative guys will use it for something. make sure to download the level's ASA files too! This level is just my fully functioning breaker box and the Jurassic Park Explorers (You heard that right, THE EXPLORERS). As I said before, the bull bars and tail light guards need to be redone with lower poly count, but Explorers 04 and 05 are represented complete with magnets. 06 and 07 need to have magnets made, however. Takes place in the first segment of PH, complete with voiceovers, thicker foliage, and hunter tents. Part of Draconisaurus 1.5 week mods. Another one of tatu's earliest levels. Go on an Easter Egg hunt! Here are the level files, wrapped in a .rar file if anyone wants to test it out. Also, its called TL2 because I found the level place holder for the non-existent Trespasser Legacy 2 by Nem. I just started modifying it and it went on from there. PS, Hunters' Camp is just work in title and the level might get it's name changed in the future. Winter level made by Draconisaurus for winter 2017. Another level made by jetblack. "Tresspasser Jetblack is the beginning of a level that is been designed, enjoy the beta of jetblack Guaranteed to work"
This is jetblack's house for the proposed TresCom Town project. The first and only test level for the Embryonics Administration area that was planned for JPDS. This is the first download part of JPDS (Jurassic Park: Dark Secrets). This is the engine you'll need in order to play the mod. Remember to read the readme! NOTE: This split download also includes the first level "JPDS~Streams" (JPDS Part 2: Streams) so if you download the split download you are not required to download that part. People who uses the non split part will still need to download "JPDS Part 2: Streams". This is the second part of the JPDS download. This includes the first level JPDS~Streams. Remember to read the readme! NOTE: If you have downloaded the split download above, you are not required to download this one as the split download already contain this. This is only for those who downloaded the Engine. The third download for JPDS. This includes the second level "JPDS~Plains". Don't forget that readme! IMPORTANT! The released version has a Field-Of-View trigger designed for widescreen (16:9) monitors. If this is not your monitor's resolution ratio, you can get corrected level files for your monitor in Mirror 1 and Mirror 2 download link. The fourth and final release of JPDS. This contains 3 levels which is all part of JPDS~Trails. Then again, remember to read the readme before you play. NOTE: This download does not include the required terrain file you'll need to play the level. However, if you have download the Split Part download for the Engine or Part 2: Streams above, they include this terrain file already. An earlier version of the JPDS-Testing level. The final version broke same parts in the level so this is kept here for people who wanna check it out. Here in an final version of the level used as the testing grounds for JPDS models and scripting, you never know what's going to happen next as strange and newly developed events unfold before you. Earlier version of JPIS: Mountain Road, in case anyone is interested. This is the first entirely new level ever done by a fan. For installation view the instructions in "JR+Readme.txt" , which is included in the .zip file. Hello, everyone it's DeadEye. You all probably remember me as the aspiring newbie who couldn't mod for his life and whom then vanished from the forums (And was probably missed by no one, I won't hold it against any of you 😛 ). Well, I'm back with some experience to bring to the table this time. In my two year absence, I've done work with Amnesia: The Dark Descent's HPL Editor (Which was surprisingly user-friendly and easy to pick up on), and then a thought struck me: "Why not go back to TresCom and try again?" After all, I had some experience in actual map-making now, and the reason I put down Trespasser modding was because of my inexperience. Long story short, I'm back to give TresEd another shot, and I'll post any new updates on Jungle Jam here. Well, my first proper attempt at a level. No particular storyline, nothing special, but here it is. Jungle Walk I, quite short, possibly challenging. Your name is Anne Jones, and you have taken your private helicopter to Juan Fernandez to go to your friend's wealthy family club. On the way, you approach an island shrouded in fog. Costa Rican Air Officials on the radio begin warning you not to approach the island. However, you do not heed their warning. Suddenly, a huge bird-like creature begins attacking your small helicopter. Anne hits her head on the dashboard of the helicopter. The helicopter nose-dives due to the animal's weight on it. The helicopter narrowly misses a huge outcrop of rock as Anne approaches the interior of the island. Disoriented, Anne flies her helicopter straight into a tree, distracting the attacking "bird". However, the helicopter is out of control and hits the ground apruptly. Now Anne has crash-landed on Isla Sorna, John Hammond's lost world. She is seriously wounded and low on health. You know what happened here and you know what inhabits this island. You now calculate your chances of surviving. They are extremely low. The lights do blink and I tried to match the speed up somewhat with the blinking in the movie as well. The fence kill boxes seem a bit finicky... Sometimes they'll work, sometimes they won't. I don't know if this is Trespasser Twilight being stupid or what. You can go inside and on top of the tower... To climb the ladder you'll have to look up and hit the jump key repeatedly... To climb back down you'll have to run at the ladder from the opposite side of the platform and tap W on the way down to keep Anne from falling too fast. The mesh is designed so that you can use the tower on its own if you want to. Thanks to TC_Isle team for some of the objects, also thanks to Andres for the blank level. 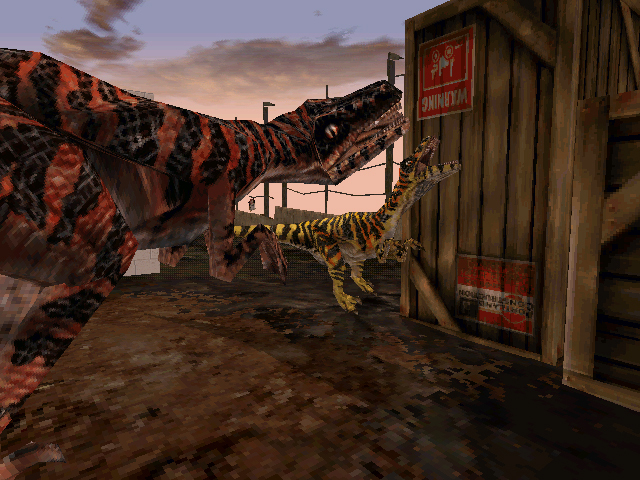 Jurassic Park: Primal Instinct is the predecessor to TheIdiot's Return To Jurassic Park (RTJP). "So I went on my very, very old computer running WinXP the other day looking for something and I stumbled across my old Tres folder on my second hard drive. I found a few extremely old levels I made years ago, the oldest dating back to 2008. One of the levels was labelled "jpark", so I had to open it up. Sure enough, it was the first ever version of RTJP - the complete and utter original, which I started in 2009. It appears I'd updated it sometime after in 2011, but probably mistakenly or something odd. Anyway, I uploaded it for completion purposes...it isn't much, just a few fences, gates and such on the foundation of my old Nublar heightmap. I think I made it as a test to check out the Raptor Pit and Main Gate that hppav made in an East Dock style setting. Eventually this blossomed into the final story of Return to Jurassic Park - at the time, the idea was actually called "Jurassic Park: Primal Instinct". The story behind Primal was that Diane Forman was one of the BioSyn agents waiting on the ship to retrieve the dinosaur embryos that Nedry had stolen (before The Game came out and told that story!). Inevitably, she realizes he isn't going to make it to the ship, so she goes into the park to find him herself a couple hours after the T. rex attack. She does not find the embryos buried in the mud, and decides to go deeper into the park to try and find an alternative to them. Of course, the fences are down and the power out, so she is eventually trapped on the island when her ship is too critically damaged to leave the island following the storm and has to go around doing various tasks to repair it until she eventually escapes, calling in an airstrike to destroy the island. Just a bit different, huh? Anyway, here's the file - I think it may actually be playable, but don't take my word on it." A side project I have been working on alongside 1.5WM.. 'Tis called, Jurassic Shore. It's a pretty small level at the moment. Like Rebel's TC~cove, JS is to be released in stages until its final version is finished. JS is a sort of vacation level, full of odds and ends. Feel free to hang out here! First part of K~OS. Some weird stuff is going on here, will you survive? And here's the SECOND version of glitchhunter09's Labyrinth level, for the archival purposes, again. The final version is 2.1, also available for download. Last Outpost is simply an experiment, but if this gets popular enough I may be encouraged enough to make it something bigger. So play away, post any problems in this thread here. takes a jeep and drives for days, until his jeep is attacked by two raptors. He flees into the house, gets eaten, etc. Lone Hunter was a mod started by Enigma back in 2006. This version is the only known version, last modified in early 2010. The mod was abandoned shortly after that. It comes with its own ATX engine. Desert level released during MMM (Mini-Mod Monday). "Ladies and gentle dinos... After 11 years, I have taken a bit of time aside from my current main project to create a sequel to the well-received "LostJunge" level. Like it, LostJungle2 presents a densely populated jungle microcosm full of dinosaurs, hidden intrigue, and exploration. Get lost and have fun! (Special thanks to TheIdiot for both several new ground foliage models and new terrain textures, both from TI~MegaJungle.)" Here's one of my very earliest test levels, based off minilev. Tonight I decided to rename it with GeomAdd, fix it with GUIapp so it can be restarted, ZIP it and upload it for you to enjoy. Have fun! MayanCity0, also known as M1C-998, was going to be one of the levels for "SG Tres", the Stargate Trespasser level series, but by the looks of things, Slug is no longer invested in that at all, and by the time he would have enough time to get anywhere with it, I don't think I'll be working much with Trespasser's engine anymore, so it is being released in this form. It features the original temporary version of the DHD (non-working and non-tangible), as well as the original low-poly, poorly-textured prop I made for Slug to represent the stargate itself. As the name implies, this was someone's first level, released on July 1st, 2009. I had to fix something in it (that's why there's another download). Unfortunately, I can't remember who the author was, so please let me identify him/her! As the name implies, this was someone's first level, released on July 1st, 2009. I had to fix something in it. Unfortunately, I can't remember who the author was, so please let me identify him/her! Similar to PlayerTest, but with Khaled replaced by Nedry (the player mesh designed for use in East Dock and its substitute meshes) instead. The old NedryLand level with some additional testing stuff for East Dock having been added by Draconisaurus and hppav. I've been working on IT level all week and I made it connect to my (incomplete) version of PV. I was working on IT for an other reason though; I'm planning on making a series of level which would start at the West gate of Burrough and end at the Summit. (AKA you take other way around the mountain. :D) Don't get too exited! I'm not sure if I will ever have enough time to complete it. BTW, that's why I was so curious about the west gate easter egg. - loads PV at end. - added toilette bols in the saloon. This is part I of a small series of levels. The level features some unique places and ideas... so go take a look! Another level and a great one too. This one sets you right into an arctic environment. Almost everything was modified. New dinosaurs, new ground textures, you name it! I must say this is one of the best levels in months. Playable version of the Jungle Road level from the PCGamer build 32. A small level based on the TestScene, using the phytestheightmap.RAW file as a heightmap to generate the terrain for the level. A level based on the Beta 96 version of Pine Valley, using the PineValley4M256x512.RAW file as a heightmap to generate the terrain for the level. - Raptor skins are now replaced with the Tribe B final skins. As you know, the Raptors in the level had problems with the colors of their mouthes and their spots were really light orange compared to the other beta levels' Tribe B raptors. Special thanks to Machf for telling me how to fix mipmap issues. =) Thanks Pal. -the T-Rex, who suffered from similar issues as the raptor has been replaced too. However, rather than a skin from the final, I replaced him with Asjad's Green T-Rex. Why? Well, from a lot of the promotional images, the "Beta Green T-Rex" apparently calls Pine Valley and a few other levels in the betas its home. Asjad's Rex is currently the closes we have that I'm aware of to that Rex. So, I put it in the level. -Stegosaurus at the end of the level works now, however, I'm not sure how well, so be aware if it seemingly wanders out of the area around you and even tries to go into the ocean close to the end of the level. It has an anchor but I'm not sure if it's in the area or not, and anyway, I have the stay near in ATX disabled so I dunno what's going on. Need to see where the anchor for that Stego is. Another level from glitchhunter09. This time he have fixed a few things in the Pine Valley level. Most is dinosaur fixes. Version 0.6 of Draconisaurus' Pine Valley remake. Version 1.0 of Draconisaurus' Pine Valley remake. Version 1.5 of Draconisaurus' Pine Valley remake. Version 1.6 (latest) of Draconisaurus' Pine Valley remake. Well I haven't worked on it for a while, I guess I could release what I DO have done that way if someone else is tired of waiting they can finish it if they want to. Also I messed up upon importing the porta potty so when you approach it the door will disappear, I believe I forgot a part of it when I exported it out of the last version of PPV that I had. First level released by Draconisaurus during his MMM (Mini-Mod Monday). A PH level contest created by Draconisaurus a few months before we received an actually copy of the original PH level. Extra stuff for the Plantation House Contest level. "It contains 4 mystery model chairs not seen before in released levels (to my knowledge), 2 voiceover trigger fixes (the first two VH ones had "VA42" instead), a custom loading image, and an additive TPA containing the beta Hammond and Anne voiceovers used in the released level. See readme for more info... Enjoy!" A very basic test level to try the substitute meshes for the custom player mesh I nicknamed "Khaled". The beta release of Slash_Master's indefinitely-delayed Chaos Effect level. Even under construction, there's plenty new to do and see as the chaos ensues. Another level created for the MMM (Mini-Mod Monday). RainBasin is an environment level for a particular scene, featuring a Styracosaur drinking calmly from a pond fed by a waterfall. Relax and enjoy..
An unfinished level made by Second Illiteration, but still playable, though. Give it a try! Don't get too excited, it's simply a quickly edited version of LJ featuring the new allosaurus I made. Enjoy though. NOTE!!! THE FILE IS PASSWORDED!! Since this is a remake of an original level, you'll need tresword to unrar the file! To prove you have a legal copy!! Well, folks, here's a little something interesting: this is the original Return to Jurassic Park level (jpark) from back when I started on the project, just after I finished playing JPDS. This was probably my second or third level, made before my other release, Trespasser Reborn, and I believe the heightmap was my first ever Trespasser modding project. 8) I think I've mentioned this before, but I managed to dig up the files and now I'm uploading them for people to check out. Anyway, this is it. I don't know if it's playable in the current state, but it can be viewed in TresEd, which I recommend since most of the puzzles are unfinished as is the map itself. If you do want to try playing it in-game, you'll have to use ATX for sure, and I can guarantee that it will not be very stable! Note that this does NOT represent the RTJP product being worked on right now in any way, shape, or form. I thought I'd just put this out there to give people something neat to check out. My skills have massively improved over time, so fret not! PS: requires ambient/effects/stream TPA files from retail Tres. Part of Draconisaurus 1.5 week mods. RexHunter99's beta release fo his "Return of PV!" level. Note: Don't bother keeping the blue keycard... it's useless until the final version. Pine Forest still is a MoT (Month of Trespasser) entry level, but It's release will be the starting point for this entire series which was originally going to be called Extended, search back through my posts to see what I mean. Expect all new Trespasser environments and use of every trick in the Trespasser engine. Well... it's finally ready to be played after 3 run throughs at 3 am in the morning... *yawn* it's now 9:30 am, and I am exhausted... And PF still isn't done! Ahh well... you'll just have to judge what I did have time to put in there. Any custom content never seen in levels before was created by me (or edited by me) the terrain textures however are borrowed from a free terrain editing application called LiquidLight. A fantastic level with an ancient roman city theme. Not your regular Trespasser level as it doesn't include guns. This is pre-packed with the ATX patch. This is the entry which obtained 2nd place in the contest. Once again, you'll need the proper files from the official Contest Level package to get it to work. Salvosuper's level, using the "minilev" as a start. Salvosuper's level renamed so it is called now "salvosuper", no longer "minilev". I think I fixed the .scn file too. A generic .scn file (doesn't care about directory) is inside the snow .zip file in case you need to replace the one inside the .rar file from the original Snow Fall level. A small level based on the TestScene, using the ShackSceneHeight.RAW file as a heightmap to generate the terrain for the level. Lots of sand... Lots of silveriness... Lots of... Well go find out. Well.... To celebrate my 5000th post here and becoming a T-Rex Hunter, I figured I should release something..... JPDS~testing still has too much sensitive stuff in it, so I decided to finally dig up my old IJ skydiving mod and release it. It's really not much, but it can be fun to play around with.. It should work fine with the retail IJ level files, just back up the GRF and SCN and plop these in. Works in demo engines if you have the original SWP handy. Here's another public version of my SoKoTres level. (Or maybe I should rename it "SoKoAnne"?) It's an implemantation in the Trespasser engine of the first level of the popular game SoKoBan. Here Anne is inside a labyrinth and she has to pull huge crates into place in order to finish the level. Don't attempt to grab the crates to pull them, as it may backfire and you may end up dead! Currently, the locations where the crates should go are marked by floor tiles with red borders. On later versions, I may use "ghost" crates instead... I haven't decided yet. The plan is to eventually implement all of the levels from the original SoKoBan (which were 20). Or maybe the ones from SoKoBan 2 (which were increased to 50). This little level contains nothing except Anne and the Spaz in front of her. It demonstrates physical shell-ejection. The trigger fires eight times, eight empty shell cartridges ( so using the Woo cheat won't reinitialize the trigger). Although I haven't tweaked it any, it looks pretty damn good to me. Goto the 0,0,0 coordinates for the single trigger that controls the action. This is also the location where the empty shell cartridges are stored until they're call upon for when the gun is fired. Demo of Stargate: Trespasser earlier than the Stargate: Trespasser Preview. Completely different from the Preview version. Prepare yourself to step through the gate, and enter a whole new world - 'cause Stargate: Trespasser is here! Step through the Stargate to explore a couple new worlds of this tech demo, and catch a glimpse of the technology that SG-1 utilizes every mission â€“ such as a working gate and ring transporter system. Download this exciting level now! Well, there ya be: the tech demo of Stargate: Trespasser, showcasing the technology that will eventually make it's way into Stargate levels. A disclaimer, though: everything works a planned, except for the fact that if you attempt to fulfill the "mission" requirements, you might experience random crashes, specifically entering/exiting buildings. Gate, DHD, and Rings still work as promised though. Feel free to use any of this content in your levels, just remember to credit the sources. Please note that this is a demo, and additional updates may become available. I was cleaning files in my Trespasser folder and found this. I don't remember that I did release it but here it is. This is a level called StegoLand, and some people know what that is referring to. Draco made this as a fun little level after all the random teleportations in Trespasser. This level also contains the cut Bus system planned for JPDS, where you could take a bus to the next busstop. NOTE: This level needs the terrain (.wtd) file from JPDS~Stream level in order to work. I didn't test this in-game but as I remember, it does work. Summit Test is a level I've made to represent some theories about how an alternate, very different version of the Summit might have worked in early Trespasser conceptualization. The level is not meant to be at all complete or expertly done, but a fun little experience and a good example of my ideas. The level uses the base settings of TestScene(Night) and a new ground texture based on a Trespasser rock. And no that shack is not final. I have some other ideas for this level but this is all I've got time to do, for now! A level made by jetblack. Two versions available. This "mod" change both objects and dinosaurs in the Trespasser levels. So far, the beach is the only level that's finished, but the other retail levels and also fan levels will be added in the future. What I've done is that I've used the ATX function that randomize both objects and dinosaurs to create a much funnier and more difficult gameplay for people who is tired to play the retail levels. "As a bit of backstory - this mod is set on the novel version of Isla Nublar." Part of Draconisaurus 1.5 week mods. Your mission is to get back to an area you've already been to: the Industrial Jungle. You need to get back there and go back through areas already explored to get off the island...again. Another stunning experience by TptDac. 11 months of work lie in this level. And trust me, you can notice every invested minute. An excellent level with an intense atmosphere. Play the updated version below. Aside from school and actually playing Trespasser I've spent hours upon hours pouring over the Trescom forums reading topics that I thought would be interesting. I'm especially interested in Pine Valley. I acually have 3 copies of the demo. One is messed up where I put 20 SPAS 12s with infinite ammo, automatic fire, and no recoil. The other one I made a tiny and a big hunting Rifle, along with an enormous raptor. But the one I like the best is my helipad level. I modified the level so that in order to complete it you have to go up into the hills adjacent to the helipads and fight the T-Rex there. Note that I only made this to show you how you can decorate a house in trespasser! This is the beta version of Tomi's newest level. It features an amazing level design. the download is a MUST! To install this level, simply unzip all the files into your Trespassercd/data folder on your harddrive. Then start up the game and select the jr level by using the level select cheat in the main menu. glitchhunter09 have released his final version of The Labyrinth he started working on 2 years ago. The name tells you everything about the level. Be sure to try it out. We know you've waited patiently for this one, watched its progress through the forums: Chronzerg's "The Lagoon." Let me tell you, this is definitely a level that you'll want to replay again and again! Thank you all for waiting so long. I now can finally, and safely, release "The Lagoon". You guys have been a major support, and have kept this project alive. This, in its essence, is a community project, for the reason that so many of you contributed to it. Thanks to TresCom Ops (for providing models, such as the dinosaurs and foliage), machf (for rigging the new dinosaurs), and several "modelers unknown". Also, I would love to thank Big Red for his great (perhaps one of the greatest) additions, ATX. So much of what this level has to offer can only happen because of this attachment. Please see the readme included with the files for a comprehensive thank-you list. This is an early beta of my Pens level, just to give you an idea of what it's going to be like without revealing too much of the final version. And there couldn't really be a better day than today to upload it. Enjoy! This is the first attempt of recreating the lost Pine Valley level. TptDac set this level up, only by using the existing models and textures of the demo level, which make this an impressive piece of work. This is a sketch of the first level: The Purussaurus Swamp. This has several elements from the orignal game, along with some other created by the members of trescom. Also added one newly created object (a crocodile skull). This swamp is devoid of giant caimans, and has Suchomimuses instead. The new versons can include Purussaurs also. tatu's "The raptor", one of his first (or maybe even THE first?) levels. Try to find the Easter Eggs! A another level I made, this one don't got any easter eggs. The Sidepath "aka Site P"
For years listed as "Site P", but the real name of this level is "The Sidepath". Makairu's "The Stampede". This is the first release, from June 10th, 2007. I haven't found the later release among my files (yet). Have you ever been interested in how the TresCom Ops develope new stuff for their levels? Well, you're now getting the chance to take an exclusive look behind the scenes! With todays update, we're actually offering you the infamous TC-Ops playgorund: the TC-Test level. Within you will find many unreleased objects and effects, which will most likely be used in the new trescom level: TC-Isle. Ever wondered if rain was possible, or scripted game animations? Download it today and you'll see! Another unfinished level made by Second Illiteration, which is playable too. And now guess what: Yes, forum member TheGuy surprises you with an all new level! This may possibly be one of the nicest levels I've seen by somebody without alot of experience in Trespasser editing. Inexperienced Trespasser-Level designer, can this be any good? Obviously: YES! Now feel free to download today! I think this is Nick3069's template (or maybe an entry?) for the projected TresCom Town mod, from September 2009. Tres: Reloaded was a project Draconisaurus started on a few years ago, this project have since then been cancelled. This version is much superior to the "Beta Version" We also recommend to download and install the "TresCom Ops Level (Act I) Patch" for increased framerate. The TresCom trilogy united in one package! This includes three of the most extensive levels ever created (tc, tc-isle & tc-rescue.). szhred's remake of the Beach level, part of his "Trespasser Experience" (TresEx) series. szhred's remake of the Jungle Road level, version 0.7 (can't find v0.8 yet), part of his "Trespasser Experience" (TresEx) series. Welcome to my first working level. Anne has returned to Isla Sorna because Jill dared her. ways the beat this level. Good Luck!!! maker, so if anyone chooses to modify this level, go ahead!!! I was talking to a certain developer tonight and look what he gave me!!! Note: This is a prank level. Not actually an official build or level. The time has come at last for a release! Ultimately, I have decided that the first level of HD, Beach, is beginning to feel and look rather outdated, especially in comparison to the work I have done on Jungle Road, the next level. Therefore, I have decided to release the current, unfinished version of Beach, since it is now in need of a full-on revamp in order to match the style of later levels in Trespasser HD. That being said, there are still some issues with the level: a few models are missing physics or even missing entirely (the Unimog in particular is not there, and you can't walk on the monorail station), and there aren't many triggers or puzzles implemented, including level-end triggers, so you'll have to exit the level through the pause menu. The level also does not contain any enemies, although in my final plans I hadn't really intended to include any in this first level. Regardless, much of the level is 99% complete and playable - up until the final area with the monorail station - and there is plenty to see and do despite its incomplete state. I recommend you explore every nook and cranny of the level as there are quite a few little off-the-path locations which might be worth checking out! Also included in the download are the current stockpile of HD textures and custom skies for CE. Feel free to use them in your own projects! I have not included any new TPA files or menues as they are currently still in-progress, but I should certainly have them finished by the time JR~HD rolls out. The ReShade which I have been using in the screenshots is also a work-in-progress, but I will release it as soon as I get it to look satisfactory. I will also note here that this level was not made with performance in mind, and that on older computers it may well crash no matter what you do. There are some trespasser.ini settings included in the Readme which may help you run the level, but I can't say for certain if they will work for you. Of course, this level also requires the use of Trespasser Custom Edition - I highly doubt ATX or retail will be able to run it. Anyway, I hope everyone enjoys the level! Make sure to let me know what you think of the level, what your performance is like, and what could be improved on in future levels. Bug reports are somewhat unneccessary at this point since I won't be doing much more work on this level, but you're of course welcome to report them. Ah yes, and have fun! Trespasser: Reloaded is intended both as a final rendering of a great number of the deductions from the community about the Trespasser that might have been and as a chance to rework the game into a fresh and exciting form that the developers would only have dreamed of (or perhaps not). The TresCom Community Project is to bring this complete set of levels to life, one at a time, by working together and distributing the work among those who have the skill, time, and dedication. The first level in the project is to be IT (aka TO), the "InGen Town". An incredible amount of speculation on what Trespasser would have been centers around the town and the various paths that lead to and from it, so I think it makes the perfect starting point. In addition to simply making the town as it may originally have been intended, we're going to inject the long-lost TresCom Town project into this one. That's right - everyone interested needs to pick out a little spot for their bungalow, post a screenshot to show their "plot", and then deliver a GRF/SCN file to me so I can import your objects (with proper renaming) into the main version. This is on a first-come first-serve basis, so show us your spot as soon as you have it! If you wish to inhabit a more specific dwelling of the town (a room in the saloon, for example), just speak up and we'll discuss it. You can use either the smaller or larger bungalow model for your home, as long as you can fill it properly. Yes, you're allowed to import new objects like posters and crap, though it might be a good idea to bring it up with me before you do so we make sure all goes well. Copies of anything in the level are at your disposal, and of course you can import objects from other levels but again, you might wanna run them by me first, in PM or here. Even better, if you want to model your own home, I'll help you make it happen. It doesn't even have to be a house, let's make this fun. Now before ya'll go diving into TresEd, I highly suggest playing through it a little, first. 😉 Works perfectly in Trespasser CE - remember to have a copy of the retail Stream.tpa in data. A fixed version of the test level for the Trespasser: Desperation project that Drac sent to be fixed, from June 2007. The first level in "Trespasser: Legacy" is officially released! Download this amazing level and get playing pronto! Featuring some amazing locales, this is a level that you'll want to explore again and again. Nem also plans to release a low-rez version of the level within the upcoming weeks, so if you can't get the level to play, have no fear. As I indicated before, I'm going to be finishing up the Visitor Center and making it a level. I do intend on doing the entire Visitor Center... There's going to be some speculative areas, due to not seeing how some of the rooms connect to others. And what I try to shoot for is about a 90% accuracy to the source material. 100% is near impossible without the plans of the sets and even then the exterior and interior sets as they were cannot fit together. Crazyraptor787's entry for the 2011 Winter Contest. Note 1: Don't forget to download the music fix made by Nick3069 under "Mirror 1" to fix an error in the music. Note 2: You'll need the "Winter Contest 2011 Engine" for the level to work properly. makairu's entry for the 2011 Winter Contest. Note: You'll need the "Winter Contest 2011 Engine" for the level to work properly. Nick3069's entry for the 2011 Winter Contest. Tatu's entry for the 2011 Winter Contest. The demo level Draconisaurus made for the Winter Contest 2011. Take a look and see what you could do with the winter contest 2011 level. This is another entry into the contest, which obtained third place. Like with the previous one, you'll need the proper files from the official Contest Level package to get it to work. This is the winning level of the Week of Trespasser 2007 Contest. You need the contestlev-130.pid and contestlev-130.swp files contained in the Contest Level package (contestlevel_release.rar, found in the "Editing" section) for the level to actually work, as per Contest rules, entries could only contain the .wtd, .scn and .grf files. This level is inspired by a level from the game "PITFALL: The Mayan Adventure" for Sega Genesis, which features music from its namesake level. A fairly brief platforming level with no dinosaurs or weapons. Have fun! I have started a level called "XmasArena" that I had hoped to finish by christmas, however it was having MAJOR issues. Damn man.. thanks machf. You've solved *most* of my problems right there. Hey there can you guys link me to a page that may have info on how to install these levels? how can be opened and executed the 1 Year anniversary level file? Is there any specific sofwtare to do it? Guys pls healp. I realy wanna play East docks. I download it. Copied the files. Now what? Dimitris, i’m not all that familiar with that level, but if you visit the forums, levels sub-forum, east dock, there are a number of threads there that you may find helpful. Good luck. how do i play these since you can’t put the files on disc. Now, where i have to put these files? Alot of the games are crashing on me during the game. Giving me that there is a fatal error. I am running on Windows Vista 2008 with an HP laptop? What can be the issue?